Ironton bed and breakfast travel guide for romantic, historic and adventure b&b's. 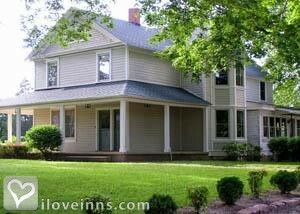 Browse through the iLoveInns.com database of Ironton, Missouri bed and breakfasts and country inns to find detailed listings that include room rates, special deals and area activities. You can click on the 'check rates and availability' button to contact the innkeeper. Right in Iron County in the state of Missouri is where you will find the city of Ironton. The town was teeming with miners of ores and other minerals and that is where this town got its name, Ironton. Ironton is the county seat of Iron County, a very fitting post since it is in Ironton where some of the most historic events in our country occurred. Considered the most important battle in the state of Missouri was the battle of Pilot Knob which was at Fort Davidson. If you are a history buff, this city would really appeal to you since you would still see almost pristine remnants of the town's history. In fact, here in Ironton is where General Grant received his commission as brigadier general and a monument was built to commemorate that event. Ask any of the Ironton bed and breakfast inns for direction. By Plain & Fancy Bed & Breakfast.